Chau Tu is Science Friday’s story producer/reporter. She delves into the inner reaches of the curious mind to pitch, write, and edit the stories you want to read on SciFri’s website. She likes exploring the mystery of the brain and about what lies beyond Earth. She really hates transcribing, but she’s pretty good at it. Seeing this giant Australian stick insect species, Ctenomorpha gargantua, in the wild would be a little like hitting the jackpot. A few males have been spotted here and there, but only three of the much-larger females—like the one pictured here—have ever been seen, according to Maik Fiedel, coordinator of live exhibits at the Museum Victoria’s Melbourne Museum. Fiedel came across the third female two years ago. He was on an annual collection trip in Cairns with colleagues from the museum when he spotted the 50-centimeter-long insect hanging upside-down from a bush (it had probably fallen from the tree canopy). Upon realizing what it was, “I started screaming,” he says. The team collected it, and the museum dubbed it “Lady Gaga-ntuan,” a play on the American pop star and the insect’s large size. “It was pure coincidence that we came across it, but we always have our eyes open for this species in particular, because everyone basically wants it [for their collection],” Fiedel says. Ctenomorpha gargantua is considered the longest stick insect species in Australia, and the second largest in the world. But so far, “almost nothing is known about the biology or ecology of the species in the wild,” says Fiedel. 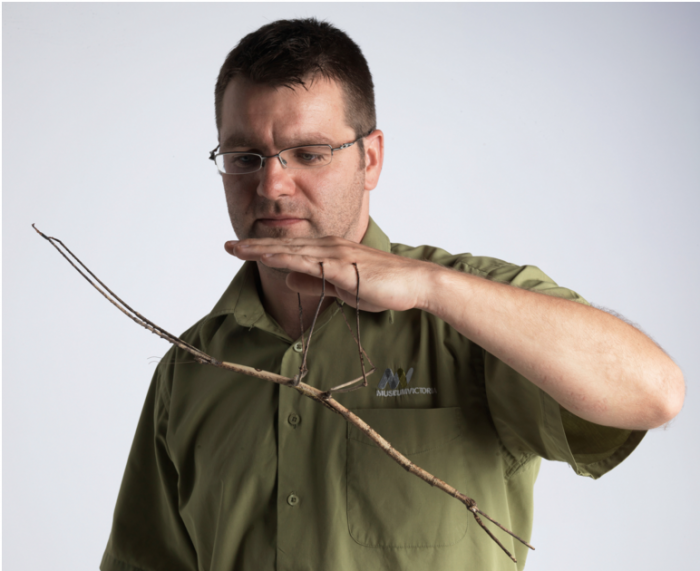 Researchers think that these stick insects spend their life high up in the tree canopies of the Australian tropics, and that could be why spying them in the wild is uncommon, Fiedel explains. Ctenomorpha gargantua is distinctive for the fork shape of its large cerci, the leaf-shaped appendages that protrude from the end of the abdomen. “No other species in the world has got cerci that long [compared] to its body size,” Fiedel says. Females tend to be a third longer than males, and their cerci are particularly longer than the males’, by about four times. Males sport long wings that allow them to fly while females, bearing shorter wings, can’t take flight. The species is also the only one known to have a certain black patch on the underside of its thorax that looks like a bullseye or a figure 8, though no one knows what its function is, according to Fiedel. The Museum Victoria’s Lady Gaga-ntuan specimen proved even more precious when she began laying eggs soon after she was gathered from the field. This was only the second time C. gargantua eggs had ever been collected, to the best of Fiedel’s knowledge. With his starter nursery, Fiedel began a captive breeding program, mating the offspring with each other after they reached maturation. Now those females have begun laying eggs. And they’ve been laying surprisingly few. 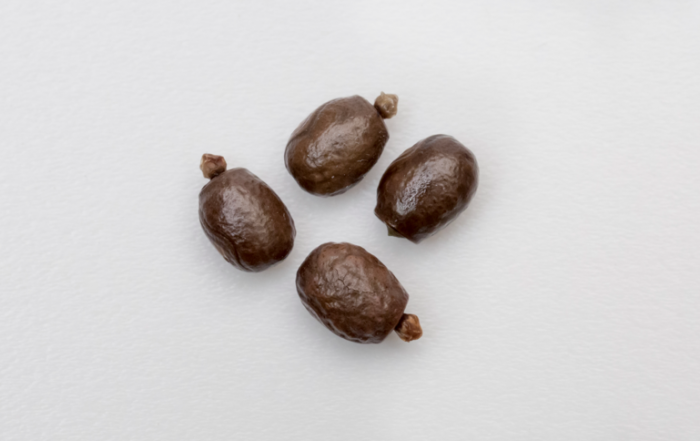 Fiedel says that more common spiny leaf stick insects usually lay 500-800 eggs over their adult lifespan, but the museum’s C. gargantua specimens have each laid perhaps a few dozen per week, though the number varies. The low output could be due to the conditions of captivity, or it could be a trait unique to the species itself. “That could explain why there’s not many animals [that have] ever been seen of this species, because they might not lay a lot of eggs,” Fiedel suggests. For now, the museum has all its live specimens on display and is hoping to maintain a stable population in its captive breeding program. That way, it can eventually share specimens with other institutions, such as museums and zoos, around the globe so “people never ever have to take [these insects] out of the wild again,” says Fiedel.